On The Addictive Nature of Breakfast Cereal. I live a moderate life. I usually insist upon whole, from scratch foods (especially in my own home), but I will stop for an ice cream cone once in a while. I will eat greasy pizza that I know has dough conditioners, and I will eat canned "baked" beans - but those are all occasional indulgences, part of the philosophy I grew up with to "do what we can, and trust God with the rest". I also read a whole lot about health and diet, but am slow to jump on the latest trend. I never was sold on Atkins, The Zone, South Beach or other low carb or carb-free diets. I can, however, see valid points to "real food" diets such as GAPS, Paleo and what is usually referred to as the NT or Nourishing Traditions diet. Nourishing Traditions ("The Cookbook that Challenges Politically Correct Nutrition and the Diet Dictocrats") is a book I've had on the shelf for several years now. I got my copy after running into an old boyfriend's parents in the health food store. His mom saw the canola oil in my cart and said innocently, "You are still eating canola oil?" Within the month, a copy of that book found its way from her generous zeal to my hands. I opened it and scoffed at the shear ridiculousness of the length of it, the unbelievable attention to detail, the amount of information also crammed into into the margins, and the simplicity of the numerous recipes. To that point, I had never heard that canola oil may not be good for you, that whole milk and full fat dairy were not actually the things that clogged arteries were made of. I couldn't be bothered with crazy, time consuming diet ideas when I had a 2 year old kid to chase around. But little by little I read that book, and found supporting information in many other places around the Internet. Gradually, I became one of the crazy people who actually think that what we put into our bodies has a huge outcome on our general health - from skin and hair to dental and digestion. My moderate lifestyle was altered even more by gradually cutting back on sugar and caffeine, and especially changing the way I think about whole grains. In particular, I no longer buy breakfast cereal. What? But breakfast cereal is the staple of my generation, the stuff we all learned to get ourselves in the mornings before school. I'll bet the vast majority of Americans still choose a box from a shelf to validate themselves as a "breakfast is the most important meal of the day" type. Breakfast cereal is still my Kiddo's most favorite thing, and given the opportunity, he will eat huge amounts of it and request it for every meal. That alone could be why I just stopped buying it. Now I get him a single box for special occasions and limit him to one smallish bowl per sitting. Even though boxes haven't been entering my house for at least 2 years now, he still loves the stuff - and I'll admit that I still occasionally long for the crunchy, quick staple too. But why are the health food nuts like me demonizing breakfast cereal? It all boils down to processing. Any quick Google search will show you in a number of places that all grains contain phytic acid, a naturally occurring acid that prevents the minerals in grain from absorption into you body. You can unlock the nutrition in whole grain by giving it the time to soak in acidulated liquid (like buttermilk, yogurt, or whey), or by first sprouting the grain and then dehydrating it and grinding it into flour. Technology is a generous benefactor. To those who have wisely used his gifts, he has bestowed freedom from drudgery; freedom to travel; freedom from the discomforts of cold, heat and dirt; and freedom from ignorance, boredom and oppression. But father technology has not brought us freedom from disease. Chronic illness in industrialized nations has reached epic proportions because we have been dazzled by his stepchildren - fast foods, fractionated foods, convenience foods, packaged foods, fake foods, embalmed foods, ersatz foods - all the bright baubles that fill up the shelves at our grocery stores, convenience markets, vending machines and even health food stores. But enough on boxes of processed cereal. We can eat real breakfasts! We can even eat real breakfast cereal once again. I just finished making a big batch of this cereal I recently read about on The Healthy Home Economist. It's good. It's really good. And even the Kiddo liked it. 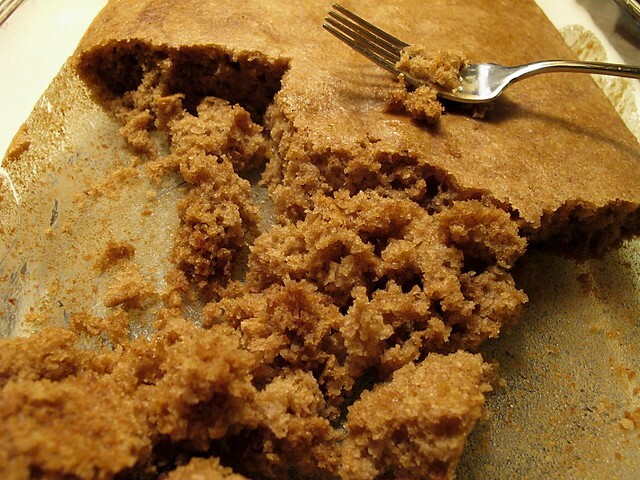 The best thing about this recipe is that it is basically a cake that is crumbled up and dehydrated. Not only can you just enjoy it as a cake the possibilities are endless for cereal flavor variations. I'm thinking even a chocolate version could easily appear sometime in the near future. I dehydrated this because I have a dehydrator, but Sarah bakes hers at a low temperature until crisp and dry. After soaking, preheat oven to 350 degrees. Add the rest of the ingredients and stir very well until well mixed. Batter will be very sticky will kind of form a single mass. Divide the batter into 2 9x13 glass pans (no need to grease them, and no need to be exact), and bake for 20-30 minutes until a tester comes out clean. Cool the cakes in their pans, then crumble them into small pieces. Spread onto dehydrator trays and dehydrate at 147 degrees (or as hot as your dehydrator goes) until fully dry and crisp - this was just overnight for me. Time will vary with heat and the size of the cake pieces. 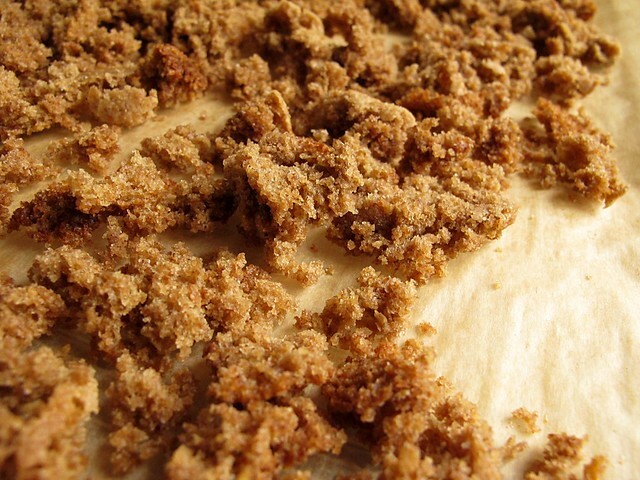 When dry, you can crumble the pieces further if you like. Store in glass jars or a zip top bag - it's recommended to store in the fridge, but I have some space so I may pop my jars into the freezer for optimum crunch preservation. I would recommend storing without dried add-ins, and adding them directly to your cereal bowl. 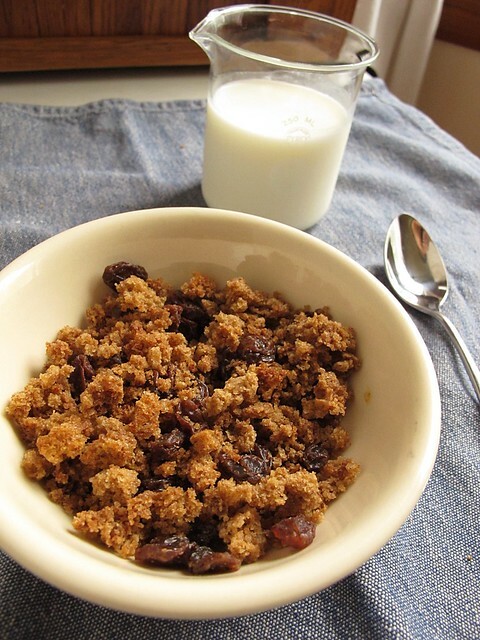 This cereal tastes exactly like a raisin or "All-Bran" type cereal, and was especially great with raisins. I'd recommend storing it out of sight quickly, because it's really easy to keep on munching on it dry. If you eat at a moderate pace, it keeps fairly crunchy in milk too. I'd really like to sneak some ginger into the batter, but may have to settle for a few cubes of crystallized ginger in my own bowl since the Kiddo doesn't share my taste for it. It's easy to want to grab a quick breakfast before running out to start our harried, modern days, so it's easy to see just why marketed boxes invade our homes. My challenge to myself was just not to buy any cereal, and then I was forced to make and eat real food for breakfast. I usually just have a smoothie fortified with chia, but it's definitely more of a challenge to satisfy a child without the aid of the almighty cereal box. But time has passed enough now that we don't miss cereal as frequently as we once did. Now with the revelation of "dehydrated cake as breakfast", the upcoming school year may have one more breakfast option on the menu. I'll take the long waiting times to produce my own convenience food, it's definitely worth it!